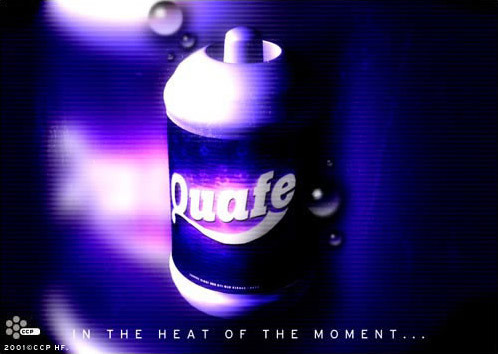 Quafe is the name of the most popular soft drink in the universe, manufactured by a Gallentean company bearing the same name. It first appeared two centuries ago and, like so many soft drinks, was initially intended as medicine for indigestion and a tender stomach. The refreshing effects of the drink appealed to everyone, however, and the drink fast became hugely popular. Quafe is one of the most widely recognized brands in the whole universe and can be found virtually everywhere. The marketing gurus at the Quafe Company have often joked that the drink was the best Gallente ambassador there ever was, and an incident between the Gallente Federation and the Amarr Empire ten years ago showed these claims to be more than just amusing hype. At the time, the Federation and the Empire clashed over ownership of the mineral rich system Girani-Fa, located close to both their borders. After the Empire discontinued negotiations with the Federation delegation, the dispute seemed to be headed straight for all-out war. But a few days later an extraordinary thing happened. The Amarrians declared that while they were ready to continue negotiations, they would only conduct them with representatives from the Quafe Company, claiming the latter were the only group within the Gallente Federation with enough vested interest on both sides of the border to be able to look at the matter from a neutral perspective. The Gallente government, looking to avoid war, agreed to these requests and so a delegation made up of top Quafe Company executives was sent to meet with the Amarrian delegation. A few weeks later an agreement was reached: the system was to come under Gallentean control, but a fixed amount of minerals was to be sold to the Amarrians each year at cost price. The Girani-Fa incident, as it has become known, clearly demonstrates the respect consumers have for the Quafe name and how strongly the company has managed to penetrate into every market. A further indication of this is the fact that the Quafe Company is the only Gallentean company that’s been given corporation status within the Caldari State. This amazing success, which has mostly come about in the last three decades or so, can be largely accredited to one man: Poire Viladillet, CEO of the Quafe Company for the past 35 years. Under his leadership the company has ascended from a position as one of several leading soft drink manufacturers into clear and undisputed market supremacy.